The Glenville Community Sign was established by the Rotary Club of Glenville, with the assistance of the First National Bank of Scotia, to inform the people of Glenville of community events that will be occurring, recognition of holidays and other individual accomplishments and recognitions. The sign is intended for the use of non-profit local organizations, such as school groups, charitable organizations, community groups, church special events and others. The sign should not be used by profit seeking organizations, political groups or business type advertisement. Church announcements should be limited to special community events ( Example: craft fairs, Vacation Bible school open to entire community, Home furnishing sales, etc) and not announcing service dates, times and events. Final approval of sign use is solely at the discretion of the Rotary Club of Glenville. Application for Sign use should be made to the Glenville Town Clerk’s office, Glenville Municipal Center, 18 Glenridge Road. Message space will be available on a weekly basis, from Monday to Sunday. Reserving space will be on a first-come, first-served basis. Frequency of requests by any single group will be factored for priority in the determination of sign use if there are multiple requests for the same week. Preference as to which face of the sign is requested at time of application (North vs. South). If there are no other applications, your message may be displayed on both faces. The Town Clerk’s office hours are weekdays between 9am and 4:30pm. 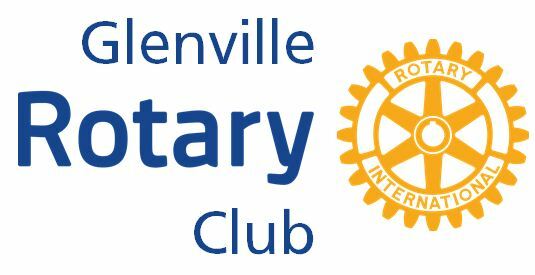 Glenville Rotary Club will be responsible for changing the messages and any message alterations. To download a copy of the application and message board layout, please click here for the PDF version. 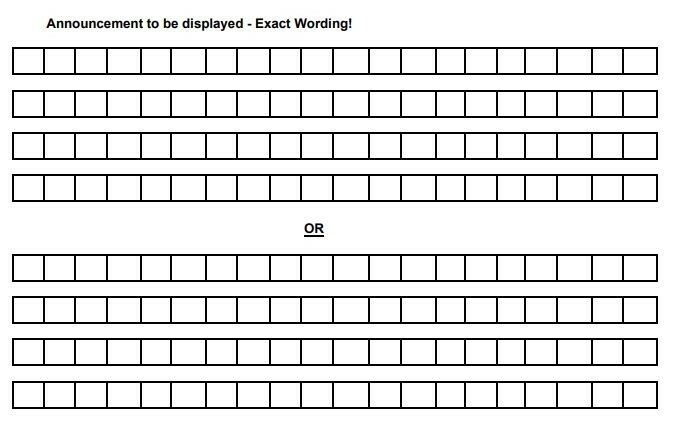 Announcement to be displayed - Exact Wording! Please make sure your announcement can fit in the sign. Use the below as a guide.